Could you use cubed steak instead of forming your own patties and if so, would the cooking time be the same? That sounds like a good idea. I haven’t tried it myself so I’m not exactly sure on the time. I saw another recipe that said do cubed steaks for 20 minutes. That seems like a long time to me. Wow, yummy!! My husband and I loved it. Made it exactly as the recipe is written and it was perfect! Now I need to check out your other recipes. Almost feels like I know what I’m doing lol. I’m new to Insta Pot cooking , Duo 8 quart for my big family, love it! I made meatloaf & potatoes cooked for 20 minutes and then meat was still very pink, cooked a little longer still pink. I ended up broiling the meat. What did I I do wrong? hmmm, weird. Did you brown them for 3 minutes on each side before pressure cooking? This was great I followed the recipe and it’s turned out perfect. Thank you. So glad you enjoyed it Shelia! I don’t have a steamer basket. Do you think a springform pan will work for the potatoes? I think it would work but you may need to increase the cooking time by a few minutes. WOW! Never heard of using ground moose before. Good to know! After the cook times in the recipe the potatoes weren’t done and the meat was still a bit pinkish. I set my Instant Pot back to cook on high pressure for 2 minutes. It made it to pressure but then gave me the burn screen. I took everything out of the pot and was able to save the food and most of the gravy. I microwaved the potatoes and patties for a minute to finish them. The flavors in the recipe are good, though I added Slap yo mama seasoning and left out the steak seasoning. I will give this another try and see what happens next time. This was the first thing I tried to cook after doing the water test run in my instant pot. It was all saved though and made a decent meal that everyone enjoyed. Hmmm. Interesting. I’m not sure why the difference with cooking times. Do you have a lux or a duo? You can keep the recipe the same. I would just place the steaks right in the bottom of the pot. If I don’t have the steamer basket, would it be fine just adding the meat into the gravy? This is a keeper! I made it as written and my family gobbled it up. Thank you! So glad you liked it Carolyn! I have a 6q instant pot do you think I can fit baby carrots with the potatoes and then separate and mash the potatoes and serve the baby carrots whole? Yes I think that would work! And it would be delish! If the carrots are soft enough, why not mash them right into the potatoes? It’s not only delicious but attractive. I usually use 1 1/4 pounds of potatoes to 3/4 pound carrots. Cut the carrots smaller than the potatoes so they will soften enough to mash. I just made this dish. Loved it. 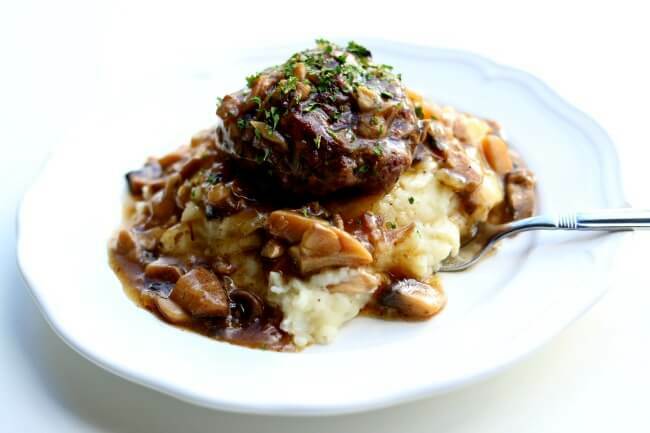 I never made Salisbury steak before. Used to have the TV dinner kind which is gross. I am looking forward to trying some of your other dishes. Haha! The TV dinner kind is gross. Glad you found this recipe instead. Can I use parchment paper instead of foil? I would think that the parchment would get all wet and weird. I made this dinner and I must say my husband couldn’t stop raving about it. He absolutely loved it. I made the steak patties as written. I even added the Montreal steak seasoning as I had it on hand but had never used it before. The steak turned out amazing. I did cook potatoes different as I had whole baby red potatoes on hand. I put them in the steamer basket and increased the cooking time to 8 minutes on manual. (The recipe for the baby red potatoes actually came from Dad Cooks Dinner blog). I added the steak patties on top of the foil and everything cooked perfectly. Even though this is my first comment to your blog, thank you for all the delicious instant pot recipes you have created. Hi Debbie, I’m so glad you and your husband enjoyed it! And your potato changes sound really yummy! I’ll have to try that sometime. This was amazing. Love the fact that it only dirties one pot. Everything was cooked to perfection and the taste was out of this world. Thanks for the great directions and making it so easy to use my Instant Pot. Love your website. Hi Marcia, I’m so happy you liked it! This one takes a little more work but it is so worth it!!! Did you use normal pressure or set it to high pressure? I just got it, and I’m still trying to learn. Thanks! Mine was cooked on high pressure. This was delicious! I made it exactly to the recipe and wow. Even my super picky husband gobbled it down and had seconds. In 15 years he has twice said “this is good” ..he called this great! Thank you for this. WOW! What a great compliment. I’m so glad he liked it. My husband thought this one was amazing too. It must be a beef/guy thing! The patties and gravy were great. The potatoes were gummy, but I didn’t use Russet potatoes, I’ll give it another try. Oh shoot! What kind of potatoes did you use? Granted I cheated and I just made instant potatoes. but this was delicious. And if anyone doesn’t have a steamer basket and isn’t doing the potatoes, I just used the metal canning lift and lined that with foil to put my patties on over my gravy. Worked like a charm. This was devoured up in my house. Is it possible to make this without a steamer basket? I haven’t tried it but you could place the potatoes in a pan or in foil probably. Our family did not care for the flavor of the Montreal steak seasoning. Any suggestions for a substitute? You could do a mix of salt, pepper, onion powder and garlic powder. That should be a little more mild tasting. Sounds good. Thanks! I am enjoying trying your instant pot recipes! 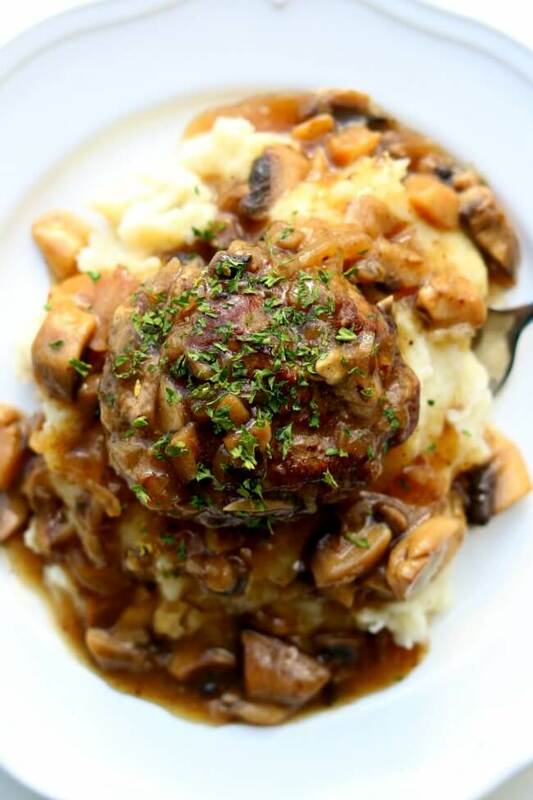 when I make salisbury steak I like to simmer the meat in the gravy, could I reverse the stacking and put the meat in the broth and potatoes above in a steamer on a rack? yes, you could totally do that. It would probably taste even better! I just didn’t have a tall trivet to do that. I need to get one! Would it work to make this recipe with ground turkey and use chicken broth instead of beef broth? Thank you. yes I believe it would! Let me know how it turns out. I’m using mashed cauliflower so I only plan to do the steak. Has anyone calculated nutritional info? 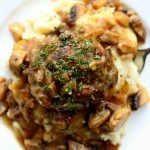 My husband is not a big fan of mushrooms but loves ground beef, gravy, and potatoes. 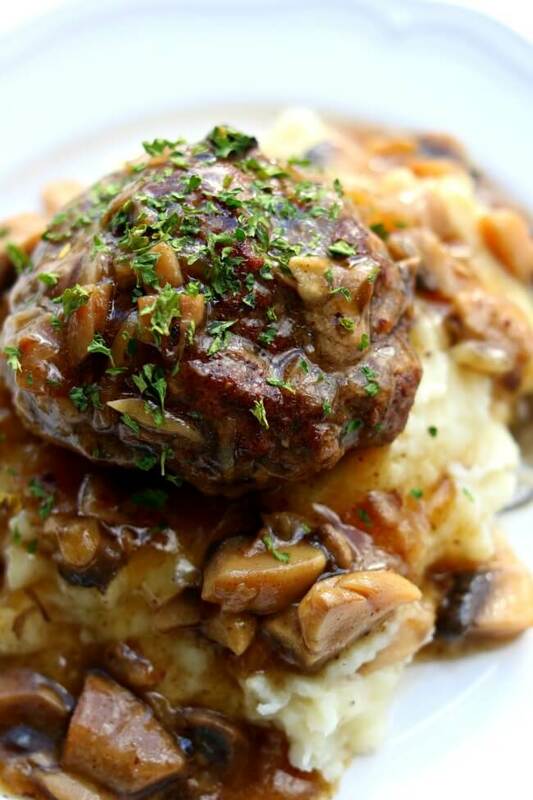 How could this recipe be made without the mushrooms? Sure, just leave the mushrooms out. You may want extra gravy so you could add in an extra 1/2 cup of broth if you wanted. Which size steamer basket did you use? I have the 6 quart Instant Pot. This looks so good! What if I want to make it without the mashed potatoes. How long do you think it should cook for? Thanks! Hi there, it should be fine without the potatoes. Just set the cooking time for 4 minutes.